As IQ scores have indicated for decades, women are more weighted towards the center in intelligence, i.e. fewer lows and highs. The outliers for education are high school and graduate school, i.e. going or not going to one of those affects your scores the most. Other levels had very similar curves. People in New England area are smart. Liberals are the breakout political ideology in terms of top-end vocabulary/IQ. Politically, “independent” seems to mean intellectually lazy, i.e. not having an opinion one way or another is more likely to be a sign of lower intellect rather than “rising above the pettiness”. This mixes well with a number of other datasets that I’ve seen on the topic. 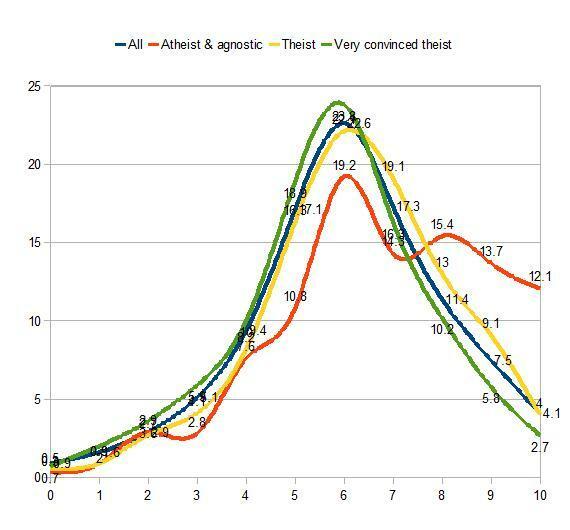 The breakout groups for religious ideology is atheists and agnostics (see the main graph above). Naturally, that’s a stunner for me. Among religious groups, Jews make everyone look like simpletons. But we knew that already. For interpretation of the Bible, the data couldn’t be more stark (unless it was beheaded): the “word of god” crowd scored the absolute lowest, and the “book of fables” group scored the absolute highest. Again, highly unexpected. For financial success information, which is one of the most interesting data points since it ties WORDSUM’s g correlation to a practical benchmark that everyone understands, i.e. “how much money you make”, the data is quite interesting. Essentially, the average wealth types are hyper-focused toward the center of IQ, while the lowest financial achievement is from those who score lowest and those who make over 100K score very high. A really interesting point here is for those who make another step above: as I’ve seen in numerous other places, this often tends to be a matter of privilege rather than merit, so that’s why the scores don’t jump away again like those with graduate degrees. Note to English teachers: hang this graph in your classrooms. For the evolution question, the graph appears to have been created by a writer for the Jon Stewart show–only it wasn’t. The “developed from animals” question breaks the camps violently at the upper end of the spectrum in a visual that I think should accompany any evolution debate. Overall, the post offers a compelling set of data that will no doubt serve as a point of reference in many future discussions. It’s both kindle for, and a culmination of, a thousand interesting conversations.